Choosing Fabric for Home Decor - Sew What Sew Anything - Sew What? Sew Anything! When it comes to home design we are all so anxious to have that item once we have made a decision. It may take us weeks to select a new chair, but once we do we want it NOW! Well, my clients are just like me, and once they commit to fabric or a design they too want it, and soon. However, sometimes we aren’t in control of the forces that be. 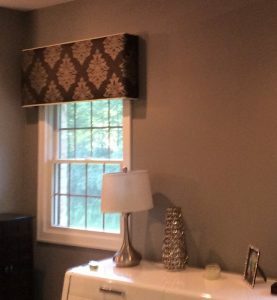 This recently happened to one of my clients with her choices on bedroom design and fabric for home decor such as drapes and cornices. We first began talking about what would enhance her bedroom last year around Christmas. Decisions were made in late January and I ordered the fabric. It was a beautiful woven piece that was just perfect for their home. In order to complete the project we needed 16 yards of fabric. This is quite a bit of fabric. After placing the order and getting ready to schedule workers, I got that dreaded call…”unfortunately we only have half of what is needed for the project.” How could the inventory say 17 yards and only eight remained? Ugh! We would have to wait three months for new stock. Trust me it was hard to go back to the client to ask her to wait the three months. Fast forward to mid-April when the fabric was due to arrive, and then yet another delay. This new delay involved a problem with the fabric and a dye issue. This time we looked for new fabric but didn’t find one that we liked as well as the original choice. More waiting! Just after the 4th of July the fabric finally arrived! 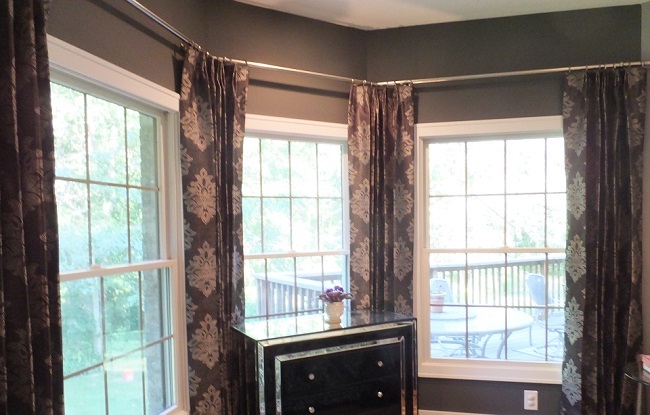 We, in the workroom worked as fast as we could to turn out four drapes and three cornices.